It's time to step away from the usual luxury sedans and feature a car that was designed to go fast and nothing else. 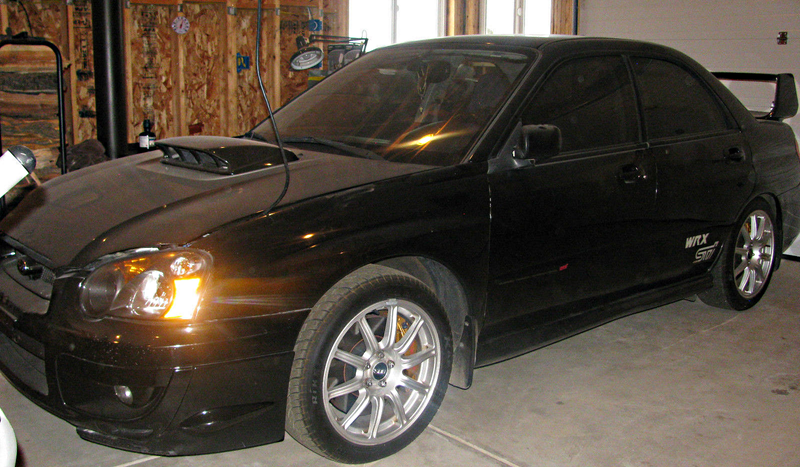 Enter this Subaru WRX STi, a 300 HP, all-wheel drive, rally rocketship for less than the price of a base model Toyota Yaris. People, decisions don't get much easier than this. I purchased a axis port for it several years ago along with a Invidia downpipe. It has a Perrin cat back exhaust. It has all new radiator hoses as you can see that were installed by the dealer when the previous owner had the vehicle due to one of them leaking. It was under warranty at the time. It has a Intake as you can see in the pic. It has blue underglows that were installed by the previous owner and it has a sub woofer in the trunk along with new speakers. All done by the previous owner. I had put new tires on it when I was living in arizona but I cant remember what the last condition of them were. I had a new clutch installed also it is a aftermarket clutch that is pretty grippy, it sometimes however makes a chattering sound when the car is in neutral and the clutch is released. but then goes away when you depress the clutch. I called clutchmasters who I bought the clutch from and they said it is normal because it is a ceramic race clutch. I dont think this car will pass Smog due to it having the axis port tune on it and the down pipe, The axis port can be changed back to stock settings because I have the little axis port computer so its pretty much the downpipe which im not sure will make it pass or not. Its a invidia aftermarket downpipe. which is why I don't have it out here currently. I was told the ac blows cold and functions fine still. This car always ran good for me and never really gave me any problems. If this car sells I will have to arrange something where I will drive back so I will be present at the time of the sale and possibly put a new battery in it and make sure everything is good with it. I have the title in hand, it is a Arizona title but has my colorado address on it. That is how the dmv wanted to do it at the time when I was registering it for colorado. I believe the car has around 79- 80 thousand miles on it, I cant remember the exact number. And im not sure if the battery is still charged to check. The interior from what I remember was in good condition and I cant really remember anything out of the ordinary, the driver seat has some wear on it from normal use. I had the gauge pillar wired up when I was in Arizona its just some basic gauges, it was in there when I purchased the car but never was wired up. I will say that they are very cheap and bounce around a lot. I would just have it taken out. Obviously the car has been modified a bit, but it's not something that can't be easily undone, or doesn't add to further power potential in the future. The car's also built with longevity in mind, so if you take care of it, it will continue to take care of you. It's certainly worth a look, as anyone should have one of these in their garage at least once in their lives.